What’s better than a handful of nuts for a mid-day snack? A little salty, a little oily, pleasantly savory and seriously satisfying. Almonds*, cashews, pecans, walnuts and pumpkin seeds are my personal favorites. That’s why Cowgirl Granola is chock full of these exact five nuts. While nuts may be small, they pack a powerful, nutritional punch and are loaded with protein–two of the main reasons I love nuts. But they are also a simple and healthy way to add texture and flavor to almost any dish. Here are a few ideas to get you started thinking about nuts in a whole new way. Sprinkle toasted pecans on top of a salad and it’s not just a salad anymore, but a meal. Replace all-purpose flour with ground almond meal or flour and a recipe instantly becomes both gluten-free and paleo. Cream cashews with water and make a decadent cashew cream which will certainly bring a vegan to his/her knees. Toast pumpkin seeds, dust them over this quinoa salad and watch it disappear. Process walnuts, add dates and a dash of cinnamon and everyone will be begging you for the recipe to this raw, gluten-free and paleo dessert. More and more, we are reading about the power of nuts. They are the “it” healthy food and the venerable Mayo Clinic promotes that eating nuts are good for your heart and will even help to lower cholesterol. They are an unsaturated fatty acid, have luscious Omega-3 fatty acids, lots of fiber, plant sterols and important vitamins and nutrients. You can read more about the health benefits of almonds here. And then my love of nuts got me thinking about my affection for almond milk. Even though this nut milk is so easily made at home, I always buy the unsweetened Califia brand which costs about $4 for 48 ounces. The ingredient list is quite lengthy, considering it should just be almonds and filtered water. Almondmilk (Filtered Water, Almonds). Contains Less Than 2% Of The Following: Vitamin/ Mineral Blend (Calcium Carbonate, Vitamin A, Vitamin E, Vitamin D2, Vitamin B12, Vitamin B2, Zinc), Gellan Gum, Carrageenan, Potassium Citrate, Sunflower Lecithin, Natural Flavors, Sea Salt. The real negative to the store bought variety is the carrageenan, a chemical that is used to thicken the milk. It is non-digestible and, although it is derived from a natural source, it appears to be particularly harmful to the digestive system and creates inflammation, which is what we don’t want. Now that I am a DIY girl (I made this lovely coffee body scrub the other day and then quick pickled red onions), I figured now was the right time to make homemade almond milk. 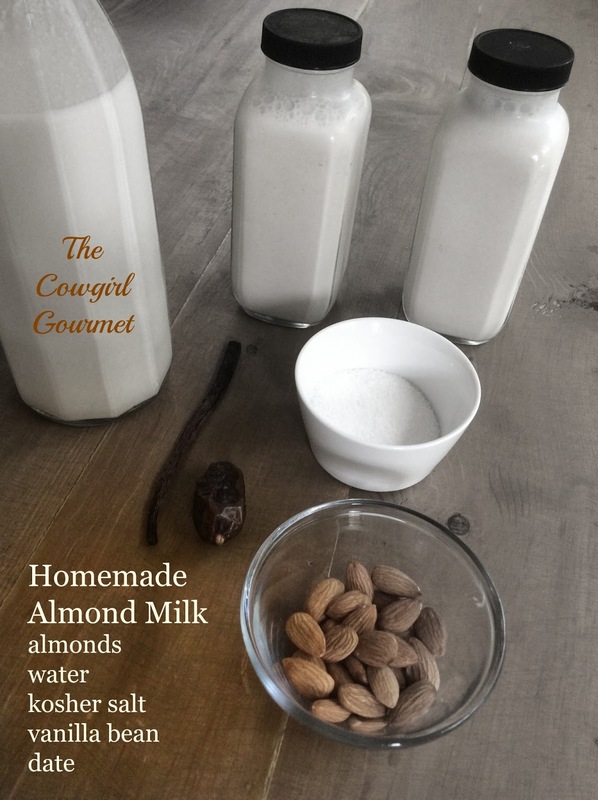 I combined two recipes from two bloggers I love, Danielle from Against All Grain, and Elana of Elana’s Pantry, to come up with an easy and absolutely fabulous almond milk made with all-natural ingredients. No filler, no fluff, no nada. Just almonds, water, a pinch of salt, a vanilla bean and a pitted date. Since I have now compared the two almond milks–Califia with the homemade alternative, I am a certified convert. The benefits are many but I see two immediate pluses: I will no longer be contaminating my digestive system with potential inflammatory ingredients (carrageenan) and I will get to use my Vitamix on the high power speed. *I know it takes tons of water to grow an almond, but here is an insightful article by Mark Bittman about the “state of almonds.” I agree that the fear of almonds is a small part of a much bigger problem. As always, we can thank MB for his hard work in uncovering the truth in food. Milk. It does the body good. But sometimes we want something other than full-fledged dairy. And this almond milk is as fabulous as it is super simple to make. So simple, in fact, I will no longer buy it in the store because the homemade version is just so much better. Place the almonds in a bowl and cover with 4 cups filtered water. Add 1/8 teaspoon salt and stir to combine. Drop in the vanilla bean. Soak for 10 hours or overnight. Strain the milk into a bowl using a fine-mesh sieve, a nut-milk bag or a doubled cheesecloth. Squeeze to remove all of the liquid.